Is This Really London's Smallest Police Station? Hari Mountford Is This Really London's Smallest Police Station? With so many police officers about in London — on foot, on motorbike, on horseback — there must be an awful lot of police stations in the capital. In fact, between the City of London Police, who patrol the area known as the Square Mile, and the Metropolitan Police, who cover the rest of Greater London, there are a total of 75 stations. They vary in shape and size: but where is the smallest in London? It's time for some investigating, Sherlock style. Is London's smallest police station in Trafalgar Square? As often reputed on the internet and by know-all friends, the smallest police station in London is a small box — not much bigger than a Tardis — on the south east corner of Trafalgar Square. Dating from the 1920s, this tiny building is made from a hollowed out lamppost, and is big enough for just two prisoners at a time (if it actually took prisoners). The narrow windows around the box may just look decorative, but in fact they provide the person inside with a view across the whole square. 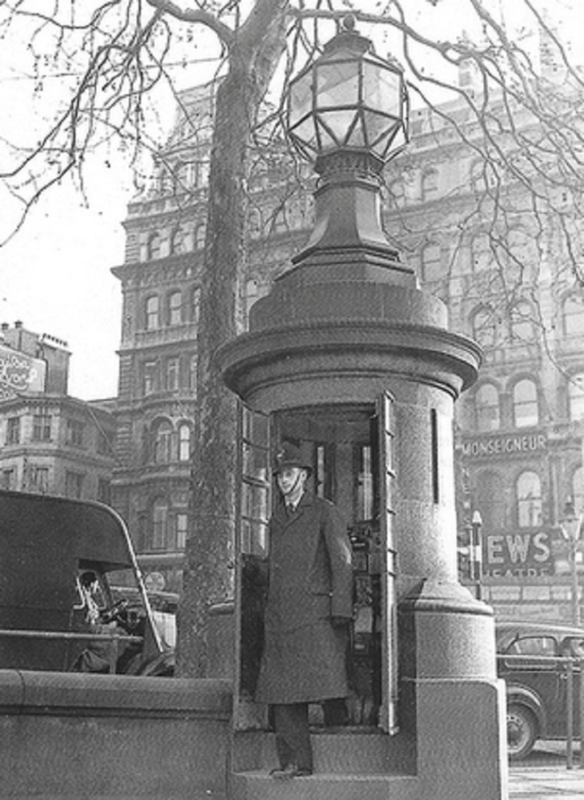 An officer would be stationed within the hollowed lamppost on days of controversial and violent protests, ready with a direct line to Scotland Yard if back up was needed. The ornamental light on top of the box (rumoured, though disproved, to have been taken from HMS Victory), would start flashing, lighthouse-style, when the alert was raised. However, this structure was never officially a station, rather a cleverly disguised lookout post. It's inaccurate to give it the title of the smallest police station in London. So if this isn't the smallest station in the London, which one is? 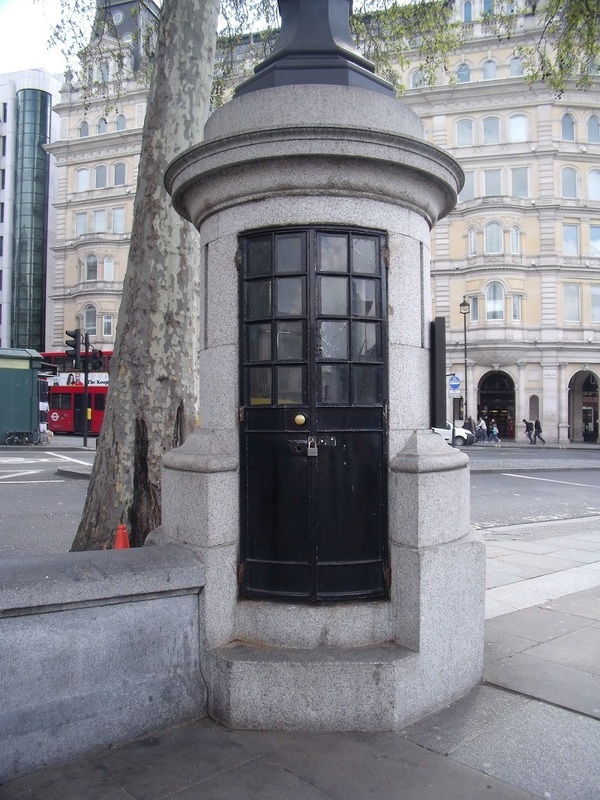 Was London's smallest police station in Wellington Arch? Heading back in time, and further west, takes us to what, until the 1950s, was the next smallest police station. 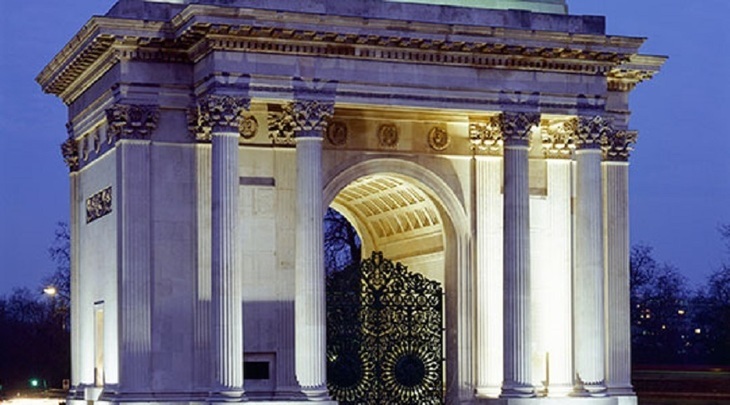 It was inside Wellington Arch, just by Hyde Park Corner, and housed 10 constables, two sergeants, a dartboard and a cat (called Snooks, since you asked). 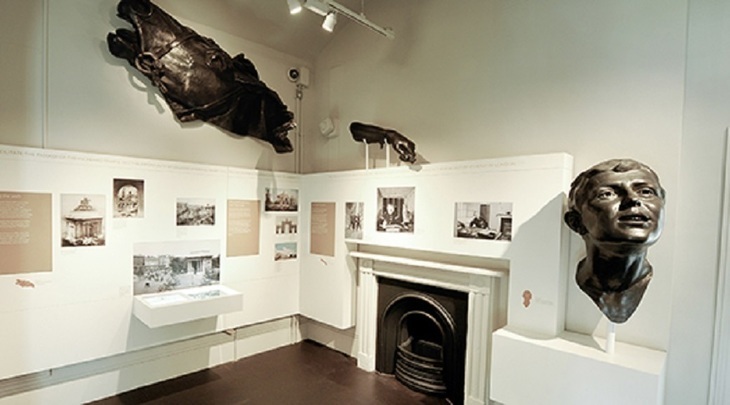 The station has since been turned into an exhibition gallery called Quadriga by English Heritage — a good use of space, perhaps, but once again foiling our investigations into London's smallest police station. So Wellington Arch HAD London's smallest police station, but hasn't for some decades. What exactly counts as a station? you might be wondering. Clearly, it is a structure with a function other than being a lookout post, as we have already gathered. According to the Metropolitan Police — who really should know about this sort of thing — a station is defined as 'any building which is accessible to the public'. So that's why Marble Arch — as opposed to Welling Arch — was never a police station as such. What's the smallest police station in London today? 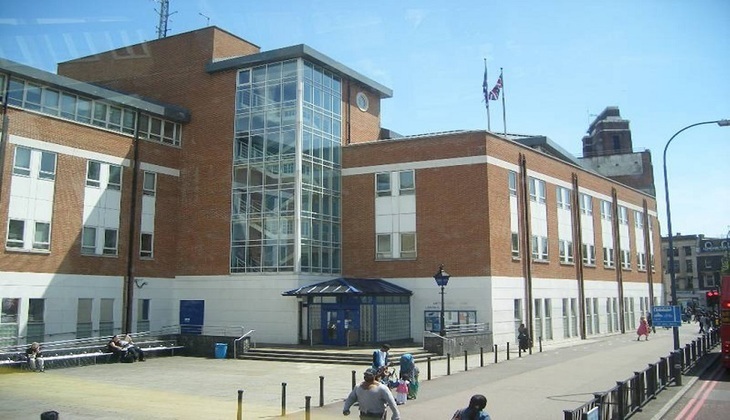 And under that definition, the smallest police station currently in London is Poplar Police Office, a publicly accessible police building which hosts a contact point. This, though, is at essence simply that — a contact point. Seeing as what we are technically looking for is a fully functioning station, we should look at police buildings that are not only accessible to the public, but that also host other operational duties. 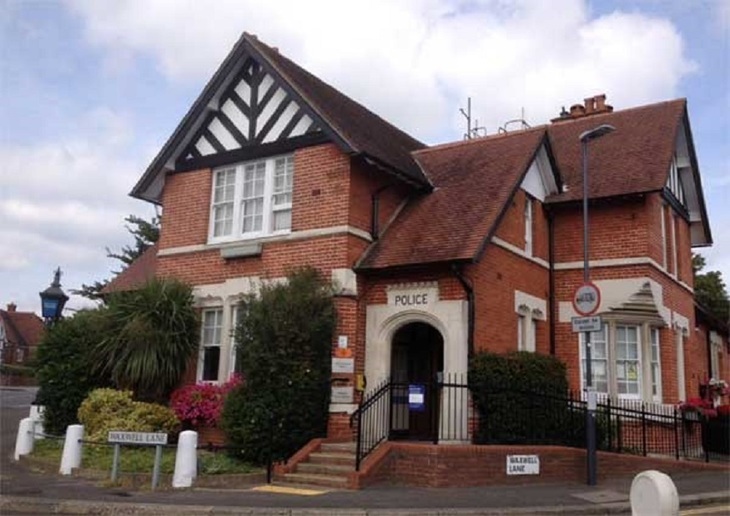 Under this definition of a police station, the official claimant of the title, the 'smallest police station in London', would be Pinner Police Station, in the Borough of Harrow and within the Met's Greater London coverage. And the largest police station in London? Under this same definition, but at the other end of the scale, the winner of the largest station in the city title goes to Lewisham Police Station, which, at one point, was also apparently the largest in the whole of Europe. (*Removes Sherlock hat, puts down pipe, and resigns detective role*). So we can safely say that neither the lamppost-style police lookout in Trafalgar Square, nor Wellington Arch's long-gone station are the smallest in the city — we have a clear law-abiding winner in Pinner. Despite the fact that the hollowed-out lamppost was never officially a police station, it is still a pretty quirky building for the police to have used (claustrophobics may disagree). Today, the box on the corner of the square has perhaps a less exciting, but just as valuable role to play in the city, as it is an Official Broom Cupboard for the cleaners of Westminster Council.